I don’t understand some of TMBs patterns, e.g. when XA leg is very big and AB retracement is very low. I thought those are invalid Gartleys, but obviously they do work. I blame my missing knowledge, but I will do my homework and hopefully will have the time to do some backtesting on them. By now I try to see the basic patterns and believe me it’s very hard for me. Hopefully contributions value will grow with time. this used to be possible in babypips, but seems like this is not the case anymore? you used to be able to write [img] and then [ /img] (without the space) and your image would embed. personally, i will only trade classic gartleys where the 78.6%, the BC projection and the ab=cd projection land very close to each other. why? … if the prz is tight like this i can run a relatively tight stop and get good R:R, ofcource though I look for other confluences too before jumping into the trade. why? because that is how TMB teaches us to trade patterns are in this thread. if you take the pattern how scott m carney takes it then technically the pattern is invalid only when price passes your X point, which gives you a large stop loss area to cover reducing profit. looking at that chart, the best way imo is to take it how TMB takes it because it has the daily msrt running through the .768 XA giving me confidence that if price did close below this point there was a decent chance of failure and that it may be better to cut losses at this point rather than hope price would recover and go back up. if for example the 1.000 ab = cd projection landed somewhat away from the .786 creating a noticeable larger prz then most likely i wouldn’t trade it personally as it is more more unpredictable how far price will range in that zone leading me unable to use a tight stop loss. an almost perfect Gartley on H1 UJ is approaching, watch out. Once it hits the PRZ I will ride this. 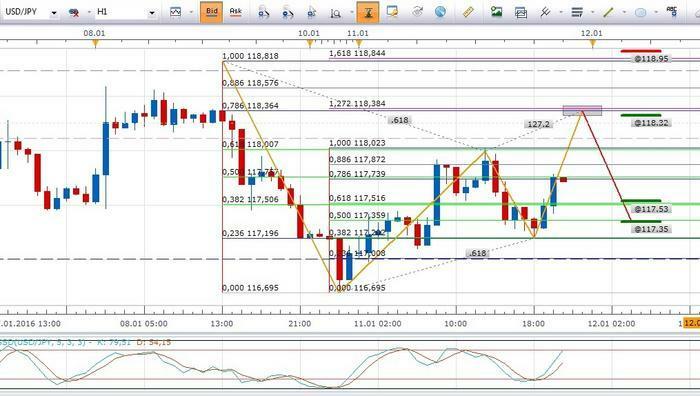 Note the beautiful symmetry and the convergence of the Fib levels @127.2. There is another high probability setup developing on EUR/AUD right now. at the time of writing price is still quite a ways from the D point …but the setup has multiple convergances/confluences making this an attractive trade should price reach there. thank you for taking your time to go over the posted chart. I must confess that I don’t get you. What I’ve measured is visible. Both of the retracements are there and the confluence on 127.2 and .786 is evident for me. It would really help me if you could post your chart as well so I can see the difference. are you sure you measured this pattern correctly?. within the first 10 pages of this thread Tmoneybags has a link to a youtube video in which he explains how to properly measure the patterns. if you are knowledgeable then why don’t you teach instead of constantly attemtping to get under people’s skin. i suspect you enjoy the latter too much, that’s why. you are right though, in that if you are solely relying on fibonacci convergance as your signal for entry then you won’t be profitable in the long run. as for the new fibs, i tried them out around a year ago. I personally found that i was doing worst with these fibs stopped using them and went back to the old fibs. However Looking back, i was still doing quite a few things wrong back then …so i may try them again sometime in the future. Well, it seems that you did the following: According to TMBs videos (of course I watched them) you repositioned the AB retracement to the CD leg. So far this is OK, because we want the inherent AB=CD pattern to be completed, so CD should be at least 1.00 of AB. But the Gartley 222 does not say anything more about the relation of AB and CD. The original Gartley does not mean, that D must be at a certain extension level of CD, but it states on page 57, that D is usually at extension level 127.2 of AB and ideally something like .786 of XA. Therefore I did the drawing the way I did. I strongly believe, that your approach could be “correct” in the way you use it, but it seems to me as if it is not the classical way the pattern was meant. I also believe that the more complicated a trading strategy is, the more error prune it is. I could imagine that using SMAs instead of a top, or a bottom could work, but I see the risk of kindof “overfitting” things, too. Might be that it works, and might be that drawn that way the Fib levels are more aligned, but I don’t want to “make the lines fit”. I just do what is done by guys like Gartley and Pesavento and try to keep things simple. By doing so I take advantage of a certain accuracy. Might be that your approach is even more accurate and profitable, but I have no reference in terms of back- and forwardtestresults. For the time being I just try to learn the basics, train my eyes to spot those within the charts and am happy if I could make some profit. Once this step is taken I would be happy to adapt some of TMBs techniques and backtest them. I also believe that the more complicated a trading strategy is, the more error prune it is. I could imagine that using SMAs instead of a top, or a bottom could work, but I see the risk of kindof “overfitting” things, too. Might be that it works, and might be that drawn that way the Fib levels are more aligned, but I don’t want to “make the lines fit”. I just do what is done by guys like Gartley and Pesavento and try to keep things simple. By doing so I take advantage of a certain accuracy. Might be that you approach is even more accurate, but I have no reference in terms of back- and forwardtestresults. For the time being I just try to learn the basics, train my eyes to spot those within the charts and am happy if I could make some profit. • Precise 61.8% B point retracement of XA leg. • BC projection must not exceed 1.618. • C point within range of 0.382–0.886 retracement. I also believe that the more complicated a trading strategy is, the more error prune it is. This is true imo. I agree. but also, generally the easier a trading strategy is, the less likely it is to make you any money in the long term. you forget trading is competitive. only 5% of people are making money long term. consider this. what percentage of traders do you think can trade a simple crossover system where you buy where one sma crosses the other one, and you sell when one sma dips under the other one? my guess atleast 80% of traders can do that. but let me ask you. are any traders actually long term profitable with such simple systems? the answer is no. personally i have never seen such a basic cross over system result in long term profits for a trader. I realised pretty early on after coming to the world of forex that the piss easy systems tended to be the ones where no one was making any real money, and after i realised this i made sure to avoid them and try and learn a more difficult system. I have been with this thread a long time, and am only just starting to reach some real competancy which has been reflected in my recent results over the last few months. It will still be quite a while before i dare say that i’m there, but at the moment i believe im on the path to consistancy. please post some actual proof of this if it is true. I saw a myfxbook of his some years ago and he was definately profitable. I haven’t seen one recently. My guy instict though, is that TMB has made considerably more money with the techniques outlined in this thread than he has lost. What is your proof for this opinion? A myfxbook from some years ago is just what that is, a myfxbook from some years ago. Please take some effort to proof your counter opinion when you challenge one elses. I would promote such opinions as I would not want everyone want to trade the same strategy (liquidity wise). Perhaps it is better to keep it for yourself. Having an opened mine is the most powerful tool anyone can have, that alone will give one the edge needed to have success in everything one does.